A Police Clearance Certificate is the certificate issued by the Criminal Record Centre of the South African Services which is a record of your convictions. A Police Clearance Certificate is a vital piece of documentation required for immigration or emigration applications. In order to be granted a visa for entry to the UAE or Saudi Arabia you may be asked to present a “certificate of good conduct” or “lack of a criminal record certificate” obtainable from your nearest South African police station. A Police Clearance Certificate or PCC is an official document used to verify your current criminal status, it serves to prove the applicant is of sound character, and is not deemed to be an undesirable person in terms of the law of the host country. At Visa Logistics we are able to assist you with the expedited service of facilitating South African Police Clearance Certificates at SAPS. Whether you are in South Africa or living abroad, we will be able to assist you. Within 5 to 7 working days your PCC will be completed. 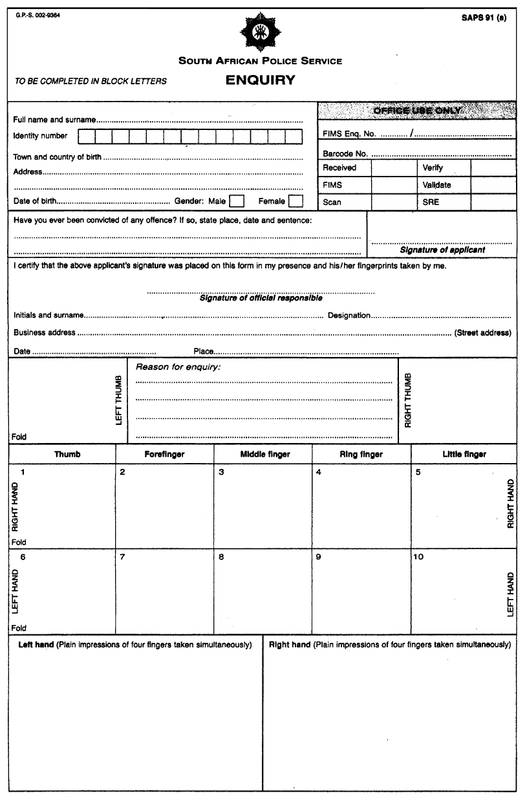 SAPS Form 91(a) is used by the South African Police Service to record fingerprints. You can download the official form 91a to see what information you may need to supply while getting your fingerprints recorded. You may be asked to provide fingerprints in a lot of government applications – including Police Clearance, Passport or VISA application. When do you need a Police Clearance Certificate? Want a work foreign permit. Certain types of occupations and studying abroad. All foreign employers will require this document as sign of trustworthiness. How long does it take to obtain a Police Clearance Certificate? Within 5 to 7 working days and if you have a prior conviction or criminal background, it can take 30 working days and longer. We collect, deliver and expedite Police Clearance certificates. Can be done earlier with cost. For all our local clients, we offer a COLLECTION, EXPEDITE and DELIVERY service. NO ADDED FEES! We will collect your application at your home or work address. We start your expedited facilitation of your PCC at SAPS the next working day. We deliver your completed PCC to your home or work address. We keep you updated every step of the process. We track your completed police clearance certificate until its safe in your hands. What is a South African Police Clearance Certificate? Also known as PCC, Police Clearance, Arrest Record, Certificate of Good Conduct and Criminal Record, a police clearance certificate is an A4 certificate issued by the Criminal Record Centre of the South African Police Service (SAPS). These certificates are official documents issued as a result of a background check by SAPS declaring that a criminal record is either absent or present. These records my may include arrest, conviction, and possibly criminal proceedings. Visit your local police station, where you need to supply a complete set of fingerprints, proof of identity, as well as fill out the application. At the police station you will be required to pay a fee of R96 (or R114 according to new regulations at SAPS) for a South African Police Clearance Certificate, and it takes anywhere from 6 to 9 months – or you can get us to get it faster for you. Your completed application will consist of your ORIGINAL FINGERPRINTS, the R96/R114 RECEIPT and please add a COPY OF YOUR PASSPORT/IDENTITY DOCUMENT. It is important to note that your full name and surname, identity number, date of birth and place of birth must be recorded on the fingerprint form. This form must also be signed by the person that took the fingerprints. If you are going to arrange your own police clearance certificate, you can submit your application at your closest police station, and they will forward it to the Pretoria Criminal Records Centre. Alternatively, you can submit your application in person, via courier or post. Visit your local South African Embassy / official fingerprint taker / local police station and get your fingerprints done. Your application will consist of your ORIGINAL FINGERPRINTS and please add a COPY OF YOUR PASSPORT. This application must be couriered to our office in South Africa. 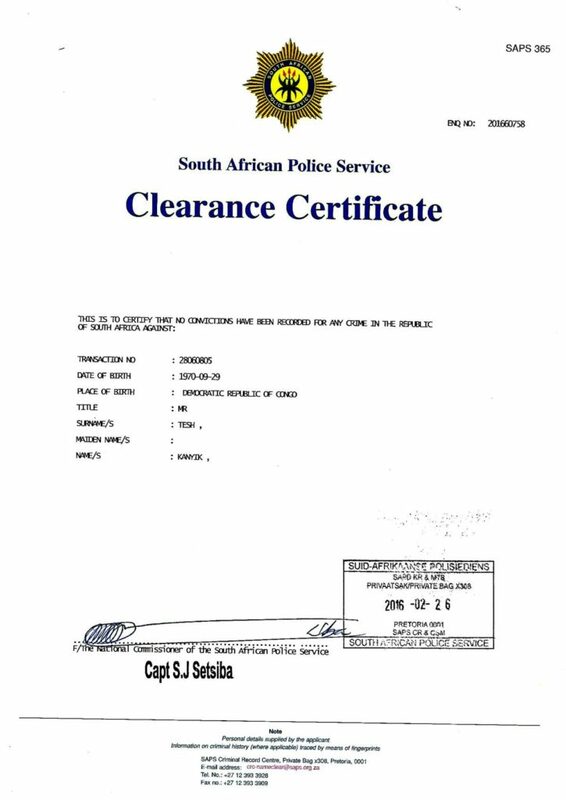 South African police clearance certificates can only be issued by the Criminal Record Centre of the SAPS. What information will be recorded on a South African PCC? If you were found guilty and charged, this offence will be recorded, irrespective of the charge. Minor offences like drunk and disorderly and shop lifting will also appear if charged, as well as admissions of guilt. If a criminal case was opened and the investigating officer took your warning statement and fingerprints, this pending case will also appear on your clearance certificate. What does not show on a PCC? Bad credit record/debt and traffic fines. When will a PCC not be issued? When a person is endorsed as wanted, a certificate will not be issued until the wanted status is removed from the person’s name. How long does it take to obtain a PCC? Normal processing with SAPS can take up to 6-8 weeks. Here at Visa Logistics we can expedite within 5 working days. Processing at SAPS will take 5 working days. If you have a prior conviction or criminal background, processing can take 10 working days, or longer. If we collect your application and deliver your completed certificate, 2 days will be added to the length of processing. Courier can be longer depending on where in South Africa / abroad you stay. In extreme urgent cases, we can facilitate certificates within 3 working days at an added fee. Can a PCC be legalised/apostilled/authenticated? Yes. Should you require a police clearance certificate for presentation in any of the countries associated with the Hague Convention then we can assist with having it apostilled. If you require your police clearance certificate to be authenticated, apostilled, translated or simply just couriered to a different office, we can assist you from A-Z, without you having to lift a finger. How long is a PCC valid for? 6 months from date of stamp. What happens when Visa Logistics receives your PCC application? We will collect your application from your work or home address with our courier team. We will send your application overnight to our team at SAPS. Processing will begin the very next working day. Processing takes 5 working days. We will courier your completed PCC to your home or work address. Applicants are to courier their fingerprints to our office in Cape Town or Johannesburg. How is the original issued certificate delivered? We work with an amazing courier company who treats all our Criminal Record Centre collections with great priority. Most certificates are couriered overnight for clients to receive the next morning before 11AM. Delivery times may differ depending on location. Can a criminal record be removed or Expunged? In what language is a South African Police Clearance Certificate issued?